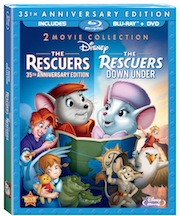 This heartwarming Disney classic from 1977 focuses on the journey of Bernard and Miss Bianca, two mice from the Rescue Aid Society who search for a missing girl. This girl, named Penny, has escaped from an orphanage and needs their help, as she has been kidnapped by the villain of the film, Madame Medusa. I had never seen this film previously. Crazy, I know, especially since this is an absolute gem. The characters are so fantastic. It did not feel that one of them had a blemish in this one. They all came together to form one brilliant group of individuals. And although this may sound silly since it is animation, the chemistry among them was top notch. I found Madame Medusa to resemble Cruella De Vil quite a bit. The wild hair, the thin face, and overall crazed demeanor was quite similar. She is definitely not the worst of the Disney villains, but she is pretty insane. As we know, with every villain comes the half witted sidekick. This one goes by the name Mr. Snoops, and listens to her every word, although it feels like he has more compassion toward Penny than Medusa does. Bob Newhart voices Bernard, which seemed completely accurate. A bit cautious and nervous while remaining laid back matched Newhart’s voice perfectly to Bernard’s personality. Newhart has appeared in many television shows and films, but is most known for The Bob Newhart Show which lasted for six years, and Newhart which was on air for eight years. Eva Gabor voices Miss Bianca. Gabor’s flirtatious voice fit Bianca’s mannerisms and the way she presented herself to Bernard and those around her. Gabor has also appeared in many television shows and films, but is well known for Green Acres that lasted six years. We know her well from voicing Duchess in The AristoCats. Geraldine Page gives us the voice of the crass Madame Medusa. Page played Mrs. Duke in The Happiest Millionaire (the first person who starts singing “Fortuosity” to me gets pinched). Joe Flynn is Mr. Snoops, which is extremely appropriate as they look similar. His other Disney connections include 1969’s The Computer Wore Tennis Shoes, 1972’s Now You See Him, Now You Don’t and 1975’s The Strongest Man in the World as the same character (Dean Higgins) as well as playing Havershaw in 1968’s The Love Bug. John McIntire is the lovable Rufus. McIntire’s Disney connections include Mr. Judson in 1974’s Herbie Rides Again and Badger from 1981’s The Fox and the Hound. Many lovable actors and actresses supplied the voices of the various other characters including Jeanette Nolan as Ellie Mae, Pat Buttram as Luke, Larry Clemmons as Gramps, Dub Taylor as Digger, and James MacDonald as the adorable Evinrude. This film is directed by Wolfgang Reitherman, John Lounsbery, and Art Stevens. The former two were members of Uncle Walt’s Nine Old Men. Stevens directed 1981’s The Fox and the Hound and was also involved in the animation department of some truly wonderful Disney masterpieces such as 1953’s Peter Pan and 1973’s Robin Hood. We know Reitherman and Lounsbery had a part in the making of this film, as well as Eric Larson, Milt Kahl, Frank Thomas, and Ollie Johnston. That makes SIX of the Nine Old Men who put their amazing touches on this classic. No wonder it was so good. The soundtrack is lovely and appropriate to the film’s environment. Shelby Flint sounds a lot like Karen Carpenter to me, which lends to its true 70s feel. Flint sings the touching tunes “The Journey”, “Tomorrow is Another Day”, and “Someone’s Waiting for You.” I also want to make mention of the insanely awesome anthem known as “Rescue Aid Society” for the group of the same name. Those are extremely proud mice, as they should be. The Rescuers is an underrated film. Everything about it is enjoyable and the Disney animators did a fine job in the creation of such a masterpiece. As I had mentioned before, this was only the first time I had seen this one. It has not become an immediate favorite of mine. There are moments where the film drags on a bit, but even that will not take away the brilliance of the film in its entirety. This is thoroughly enjoyable and I look forward to watching it again. Highly recommended! Faith makes things turn out right. Great review. Dead on. Todd and Ryan watched a different movie.